Recounting the true stories of twenty-six Christian heroes, this compelling book for middle readers celebrates the men and women who were determined to do the right thing, no matter the cost. Jozef Zwonartz sacrificed everything he had to hide a Jewish family. Alfred Rosner, a German Christian, was executed by the Nazis for helping Jews. Mother Maria Skobtsova was a Russian nun who was imprisoned in a concentration camp for smuggling Jewish children out of Nazi-occupied Paris. Complete with a glossary of important terms and illustrations of the heroic figures, this newest Toby Belfer adventure is an important lesson in world history for young readers. Including the stories of Corrie Ten Boom, Heinz Dorssel, Princess Andrew of Greece, and the students in Whitwell, Tennessee, and their incredible Paper Clip Project, this book will give children of all faiths the ability to believe, in the words of Anne Frank, that despite everything, people are really good at heart. Gloria Teles Pushker holds a MA in education with a concentration in children’s literature from the University of New Orleans, and she is a member of the national Storytelling Association and the Coalition for the Advancement of Jewish Education. Her other Pelican books include Toby Belfer Never Had a Christmas Tree, Toby Belfer’s Seder: A Passover Story Retold, and A Belfer Bar Mitzvah. She lives in Metairie, Louisiana. Mel Tarman has worked as an executive, entrepreneur, and educator. In addition to having worked in publishing for many years, he served in the United States army during the Korean Conflict and earned a master’s degree from New York University. He resides in Galveston, Texas. This is his first book with Pelican. Emile Henriquez is a prolific commercial artist, graphic designer, and calligrapher. He studied drawing, painting, design, and art history at Tulane University and has worked as a graphic illustrator since 1963. He is the illustrator of Pelican’s Oklahoma Land Run, The Battle of New Orleans: The Drummer’s Story, and the popular D.J. Series. 29 illus. 1 map Glossary Biblio. Click here for Chapter 1. 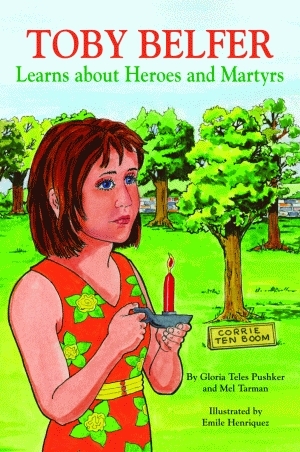 Click here for the Toby Belfer Learns about Heroes and Martyrs study guide.